The names of Django Reinhardt and Stephane Grappelli are familiar to many as pioneers of all-string jazz. Less universally known are the names Joe Venuti and Eddie Lang, the Italian-American duo who played hot violin and guitar jazz in the 1920s and 30s. Joe Venuti has been referred to as ‘the father of jazz violin’, while his musical partner Eddie Lang is widely regarded as the first jazz guitar virtuoso. 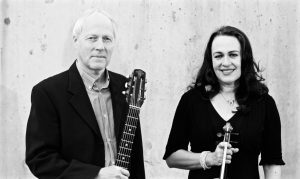 Bringing together their shared knowledge and love of early jazz styles, Emma Fisk and James Birkett present an entertaining, virtuosic and informative programme of music inspired by the first great jazz violin and guitar partnership. A typical performance includes quirkily named compositions by Venuti & Lang such as Cheese & Crackers, Kickin’ The Cat and Black and Blue Bottom; jazz standards of the 20s and 30s; and specially composed originals that explore the duo’s sound-world, all set in context with snippets of biographical and musical information & entertaining anecdotes. Nominated in the prestigious British Jazz Awards 2018, Emma has attracted critical acclaim for her performances of Venuti’s repertoire at UK jazz festivals and featured in the musical role of Joe Venuti in the 2015 London Jazz Festival. James has been performing Lang’s repertoire since the late-70s and his transcriptions of Eddie Lang’s solo guitar pieces are published by IMP. 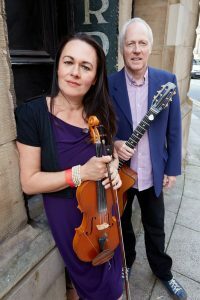 James and Emma’s debut album was released in Spring 2018 to critical acclaim and the duo were featured in a live broadcast from Sage Gateshead on BBC Radio 3’s Jazz Record Requests with Alyn Shipton.